With a retail starting price of $1,099 (USD), the 21.5-inch iMac features an LED-backlit display that runs at 1920x1080 resolution with support for millions of colors. The desktops also come equipped with a 2.3GHz dual-core Intel Core i5 processor that can Turbo Boost up to 3.6GHz. Also included with the standard configuration is 8GB of 2133MHz DDR4 onboard memory, although the systems can be configured with 16GB of RAM. Storage options included a 1TB 5400-rpm hard drive, 1TB Fusion Drive, or 256GB SSD. 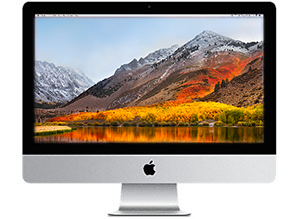 Like the 21.5-inch iMac 4K and 27-inch 5K, each iMac HD also has a FaceTime HD camera and Thunderbolt 3 digital video output. Price with $25 promo code APINSIDER. Adorama will not collect sales tax on orders shipped outside NY and NJ. As always, if you have any issues, you can reach out to us at priceguides@gmail.com and we'll try and help.